Pastoralists' role in contemporary Africa typically goes underappreciated and misunderstood by development agencies, external observers, and policymakers. Yet, arid and semi-arid lands (ASAL), which are used predominantly for extensive livestock grazing, comprise nearly half of the continent's land mass, while a substantial proportion of national economies are based on pastoralist activities. Pastoralists use these drylands to generate income for themselves through the use of livestock and for the coffers of national trade and revenue agencies. They are frequently among the continent's most contested and lawless regions, providing sanctuary to armed rebel groups and exposing residents to widespread insecurity and destructive violence. The continent's millions of pastoralists thus inhabit some of Africa's harshest and most remote, but also most ecologically, economically, and politically important regions. This study summarizes the findings of a multi-year interdisciplinary research project in pastoral areas of Kenya and Ethiopia. The cultures and ecology of these areas are described, with a particular focus on the myriad risks that confront people living in these drylands, and how these risks are often triggered by highly variable rainfall conditions. 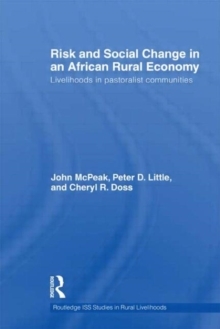 The authors examine the markets used by residents of these areas to sell livestock and livestock products and purchase consumer goods before turning to an analysis of evolving livelihood strategies. Furthermore, they focus on how well-being is conditioned upon access to livestock and access to the cash economy, gender patterns within households and the history of development activities in the area. The book concludes with a report on how these activities are assessed by people in the area and what activities they prioritize for the future. Policy in pastoral areas is often formulated on the basis of assumptions and stereotypes, without adequate empirical foundations. This book provides evidence on livelihood strategies being followed in pastoral areas, and investigates patterns in decision making and well being. It indicates the importance of livestock to the livelihoods of people in these areas, and identifies the critical and widespread importance of access to the cash economy, concluding that future development activities need to be built on the foundation of the livestock economy, instead of seeking to replace it.